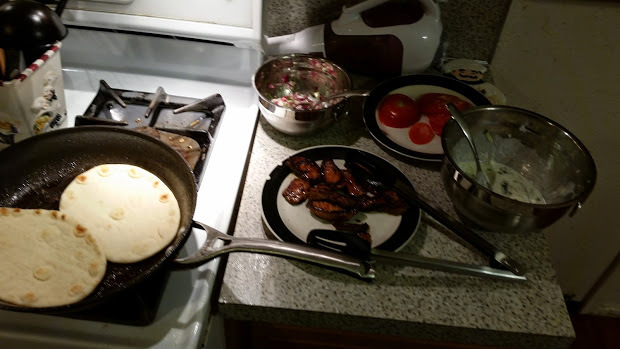 Friday night I made Steak Gyros with Cucumber Yogurt Sauce and they were quite tasty!! I’m still not good enough to get under the estimated time frame, but I’m working on it. 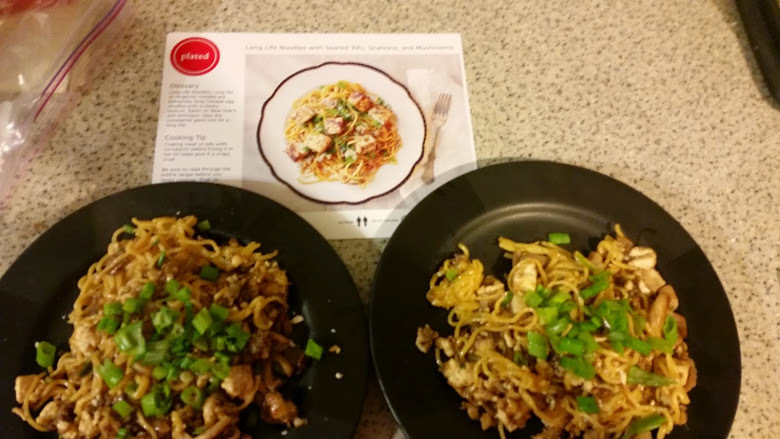 Plated said these would take 20-30 minutes, it took me 31 and I even had help! These were 530 calories per serving, and very filling. My husband helped with some of the chopping and flipping the meat. As always, chopping and slicing was the most time consuming item. 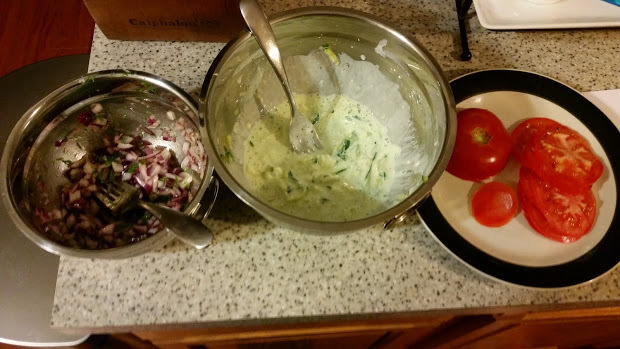 One important thing we forgot to do was to dry off the shredded cucumber, it made the yogurt sauce very watery. 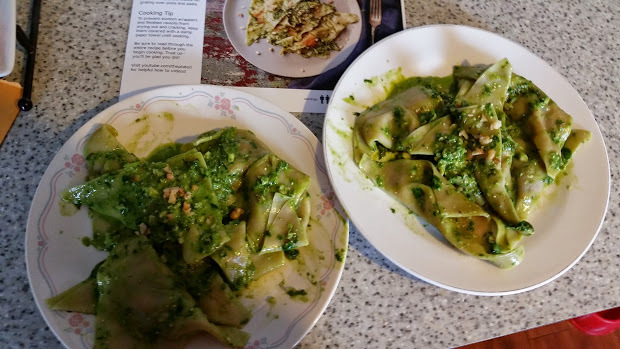 I think the worst part about Plated is all of the dishes it creates. SO many dishes to wash!! But the food is really good, healthy, and I am learning new skills. 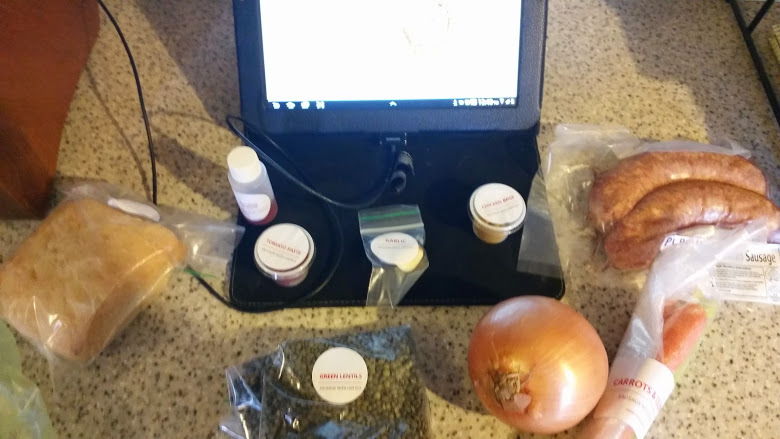 Despite following the directions, we seemed to have a lot of extra onion mixture. My husband and I just aren’t that big on raw onion, so we did use it as more of a garnish. Also, I diced it instead of slicing. 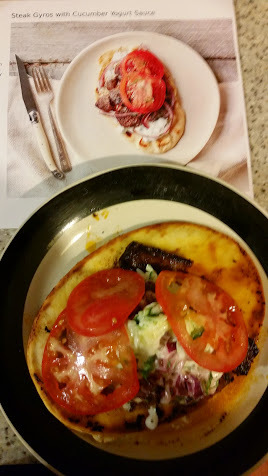 Overall this was a fairly easy dish, and I could see myself making my own yogurt sauce in the future, or maybe even tzatziki! 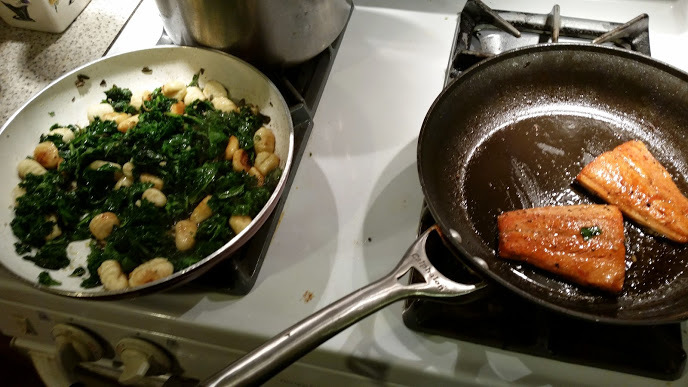 Last night I made Blood Orange Wild Sockeye Salmon with Brown Butter Gnoochi. It was the best plated meal yet!! The meal was 790 calories per serving, and said it would take 20-30 minutes. It took me about 35, but I at least was able to unload the dishwasher and wash dishes throughout the process. 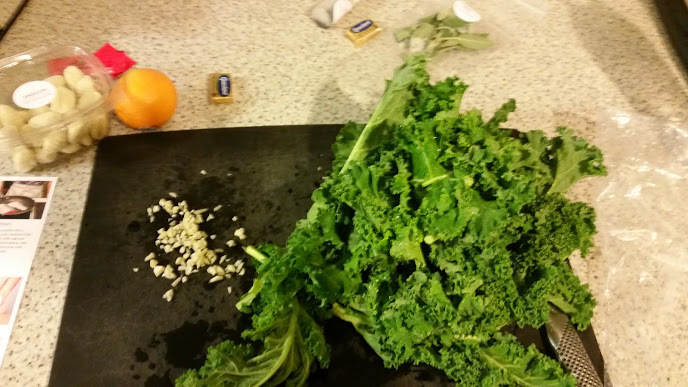 There was a lot less chopping in this meal, just garlic, sage, and kale. But there was SO MUCH KALE! 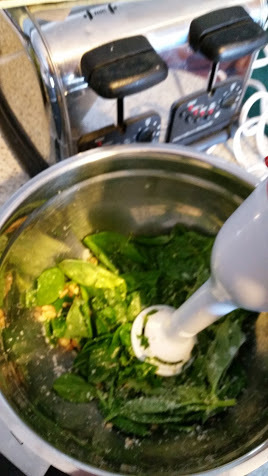 I’ve made kale before (and kale chips nom nom nom), so I know it loses a lot of volume when it’s cooked. 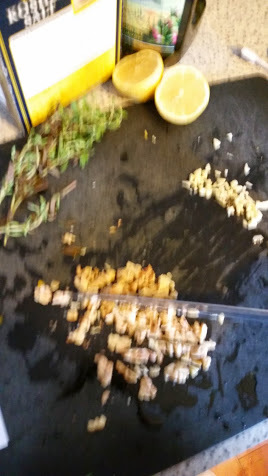 The recipe said to discard the stems, luckily my two dogs LOVE crunchy veggies and were happy to eat the scraps. My older dog looks at them as treats and takes them into the other room to enjoy in his standard treat spot. I felt that of all the recipes so far, this was one I am most likely to try to cook on my own. 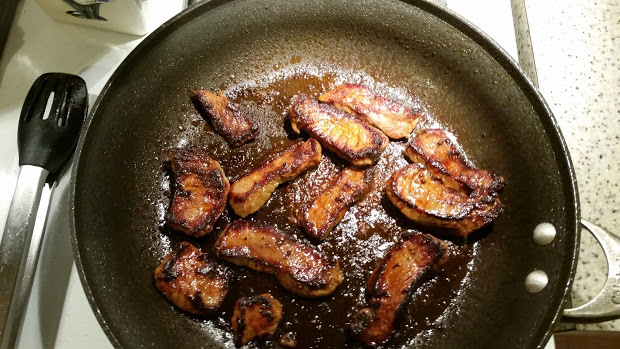 The easy glaze of a blood orange + soy sauce + Worcestershire sauce is something I could whip up without a fancy recipe card, and my hubby LOVES gnoochi. And now I know how to brown butter! I mean, it’s pretty easy. You just put butter in a pan and stir it occasionally until it’s brown. 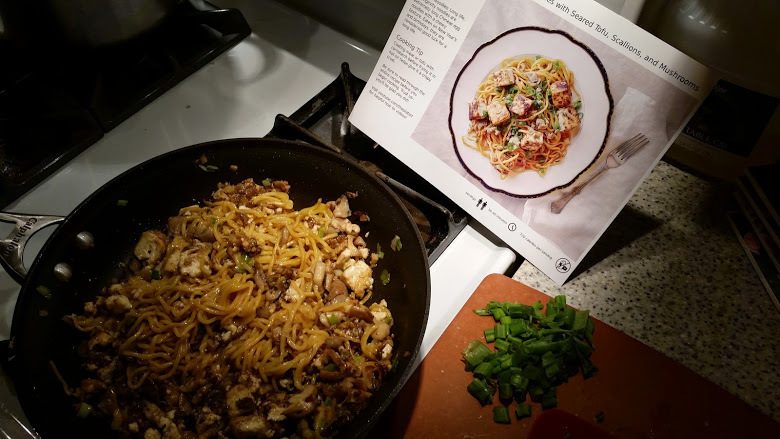 But I do feel like Plated is teaching me a lot of new cooking techniques. 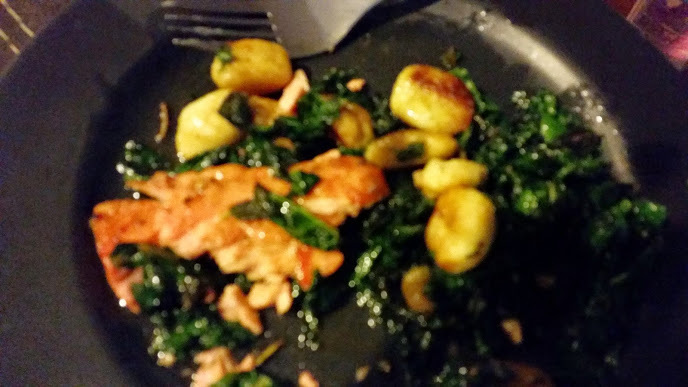 Here’s a photo while it’s cooking, I was using the same spatula in both pans, so that’s why there is kale on the salmon. I thought I had a picture of the two finished plates, but unfortunately my phone misled me. Could have been operator error. But here’s a picture of my half eaten plate, haha. 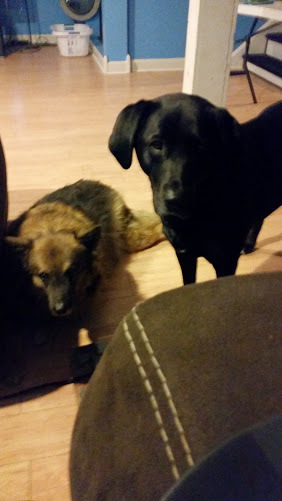 My puppies were very interested in what we were eating, and made sure that they were available if I were to drop anything. They got a treat on Sunday when I accidentally spilled lentils all over me and the couch, I’m sure they were hoping for a repeat! 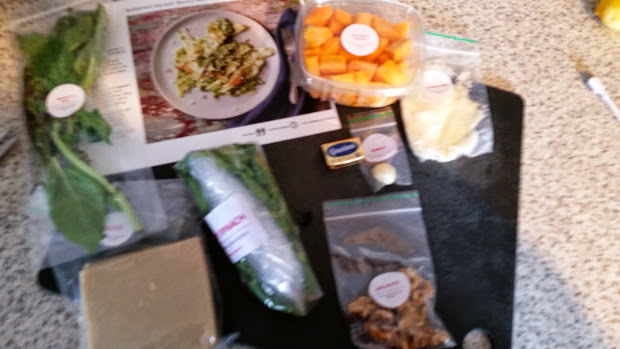 A couple people have asked me if Plated is worth the cost. 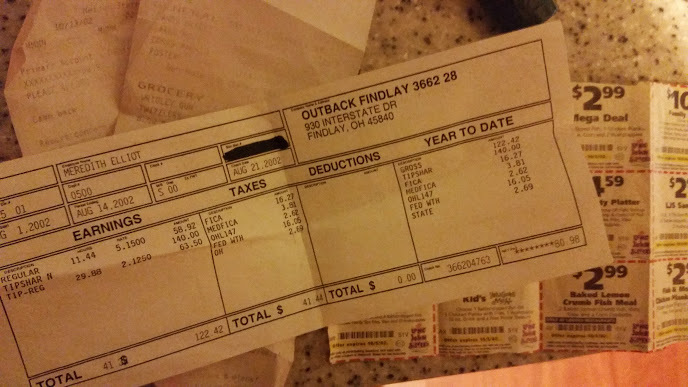 It’s not cheap, it’s a minimum of $12 a plate, so $24 for a meal for 2. It’s not cheaper than cooking. That being said, if I was to attempt to recreate this, I would easily spend over $24 in gathering the necessary ingredients. You can’t typically buy just a tablespoon of this or a single spring of sage, but having the larger quantities would lend it to other meals. But knowing me, it’s just as likely to go bad before I use it. 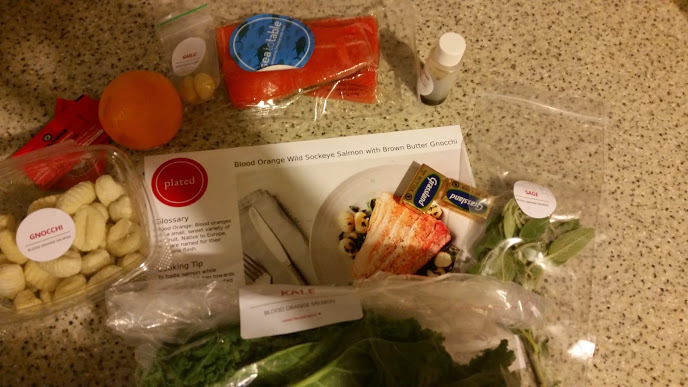 If I wasn’t using Plated, I would probably order in, get carryout, or go to a restaurant. All of which would easily cost more than $24. Plated is not for those who are on a tight food budget, or those who don’t want to spend 30-60 minutes prepping, cooking, and cleaning. But if you are a person who typically eats out but wants to learn to cook, I think it’s worth a try. My code below will give you 2 free plates! My 3rd and final plated meal from my first shipment! Not my final ever, I have a box coming today and another one coming on the 20th. I am going to do this every other week to start, because it’s not cheap. But it is delicious, teaches me new recipes, saves time at the grocery store, lets me hone my chopping and cooking skills, and gets me off the couch for 30-45 minutes. 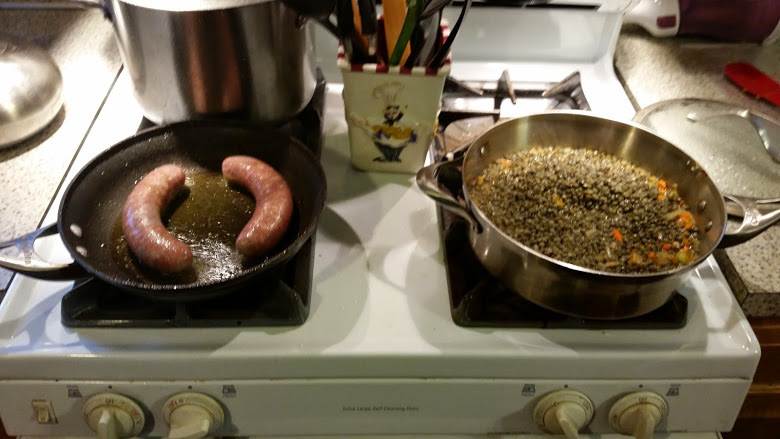 On Sunday I made Sausage with Lentils. This recipe was 810 calories per serving and said it would take 30-40 minutes. It took me about 45. I’ve never made lentils before. 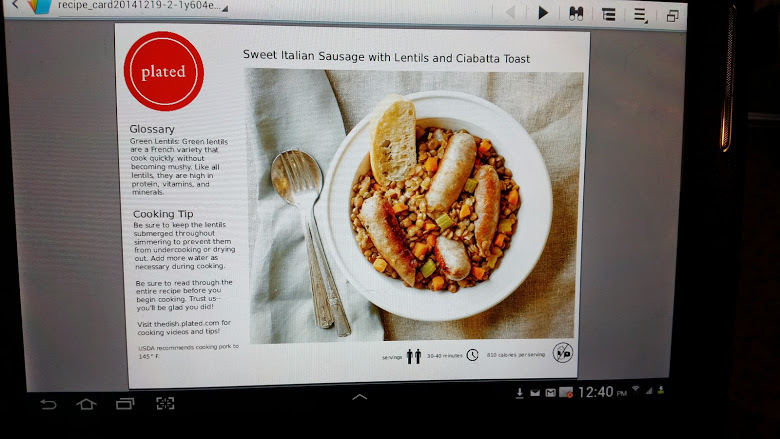 I had unfortunately lost the recipe card due to a cleaning binge, but luckily was able to download it to my husband’s tablet for easy viewing. Once again I had lots of chopping to do and chose a way too small cutting board. I had to chop the onion, carrots, celery, and ginger. At one point, my husband was trying to talk to me and I had to (nicely) ask him to check in with me later as I had to take the bread out of the oven, turn the sausage, and add the red wine vinegar to the lentils. 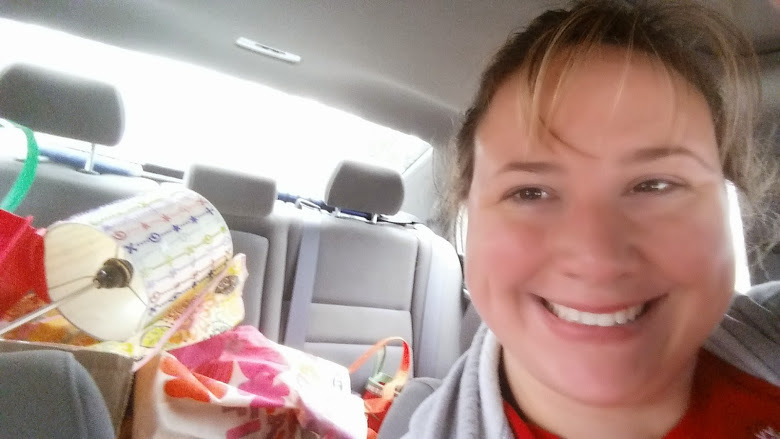 Other than that, I once again had a nutritious and delicious meal that my husband said he would eat again. I also had lots of dirty dishes. I forgot to take a picture of the food plated, but I think you can get the idea from this one. 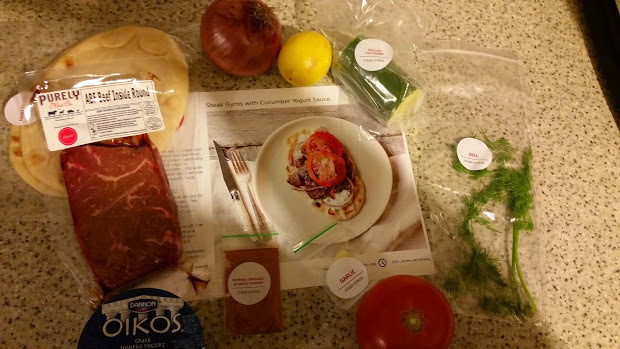 I am really excited for my next box, it includes Steak Gyros, Butternut Squash Ravioli, and Blood Orange Salmon. 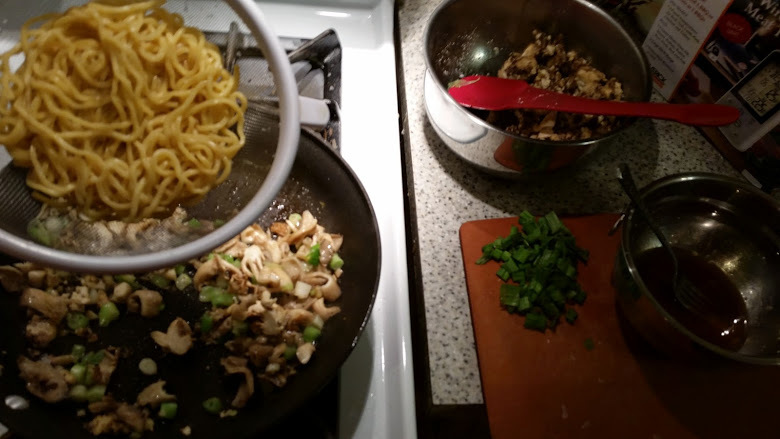 On New Years Day I made the Long Life Noodles with Seared Tofu, Mushrooms, and Scallions. The recipe card said that it was a traditional New Year’s meal in China, as they are “considered good luck for a long life”. I know that Chinese New Year’s is a different date than 1/1, but figured it would bring good luck anyway. I’ve never made tofu before, so that was a first for me. The meal was 720 calories per serving and said it would take 30-40 minutes. It took me 34. 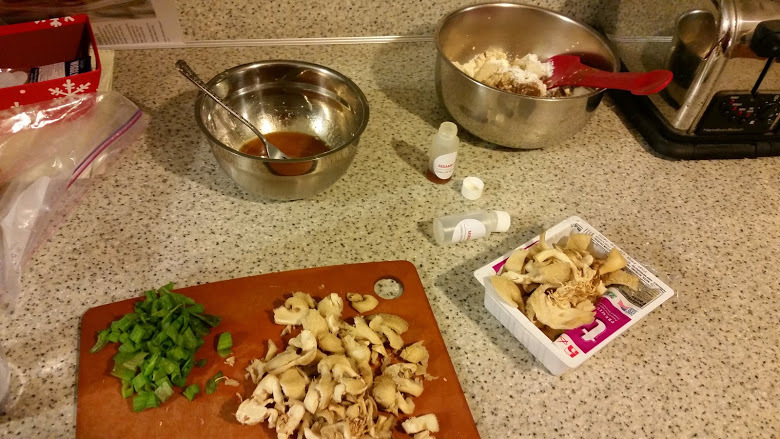 There was a good amount of chopping- the scallions, garlic, ginger, and mushroomies. 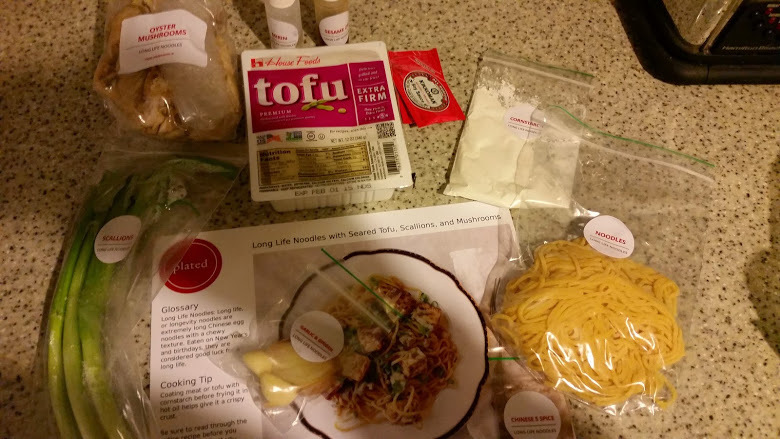 I should have used a larger cutting board, I ended up storing some of the items temporarily in the empty tofu container. 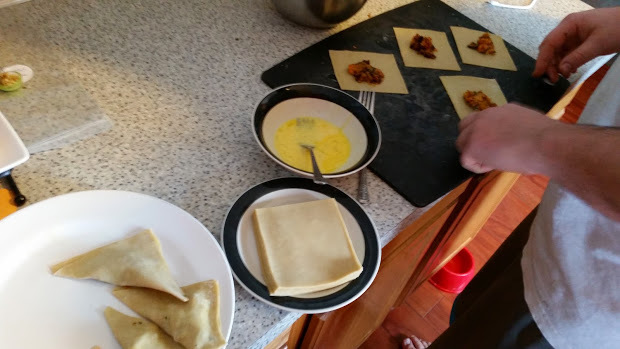 I had a hard time with the tofu, it was NOT in pretty 1′ squares despite my best efforts. Also, I didn’t make sure to rinse AND separate the noodles, and they ended up sticking together too much. Even so, this was a delicious nutritious meal, and taught my husband and I that you don’t always need meat.